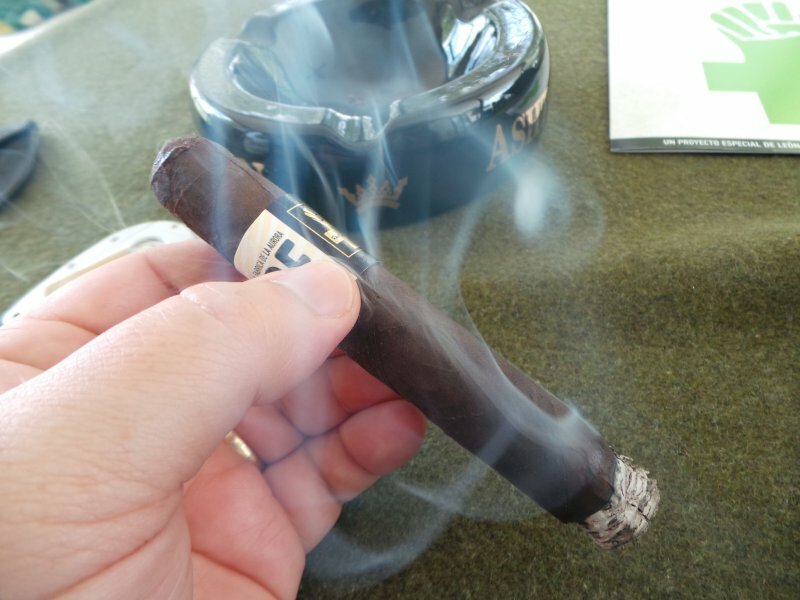 I stopped by the Viva Republica booth at IPCPR not really knowing much of the company. After speaking with them, and doing a bit of browsing around their website, it turns out the company’s origin lies in a partnership owner Jason Holly has built with La Aurora, who is producing the cigars for him. 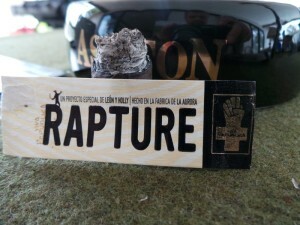 Making their second IPCPR appearance this year, they are introducing two new offerings into their stable – a maduro version of their existing “Rapture” series, and the “Guerrilla Warfare,” a 4″X41 petit corona containing a 5-country blend of tobaccos. The Rapture Maduro will be available in the same four vitolas as the original – Perdition 4.5″X50, Revel 5.5″X54, Exodus 6.25″X52, Harasha 6″X58, with MSRP ranging from $7.80-9.00. 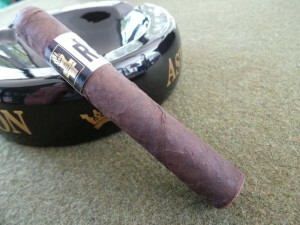 Today, I’m smoking the Revel (MSRP $8.40), available in boxes of 20. This is the second I’ve smoked from the line, provided by Viva Republica. It carries a Mexican San Andres wrapper, covering a DR Corojo Ligero-bound filler blend from Nicaragua, Brazil, Peru, and the Dominican Republic. In giving the Revel a cursory exam, the depth and consistency of color in the deep, dark-brown wrapper is striking. The wrapper has just enough oil to provide a silky feel, but not so much as to be moist to the touch. It is moderately veiny, with just a couple of significant veins present in the leaf. 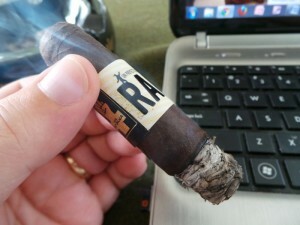 I don’t find any soft/hard spots; in fact, the density is very uniform throughout the length of the cigar. Before lighting, I find the resistance to be in the sweet spot for my personal tastes. It is slightly deliberate but free. The prelight aroma is of sweet hay along the wrapper, and a bit “darker” at the foot – with some raisin-like flavors shining through. At first light, the initial puffs produce a caramel-reminiscent sweetness; almost – but not quite – sweetened cocoa, tempered with the slightest bit of spice through the nose; a full retrohale showcases this spice a bit more – but it’s never dominant. By the end of the first inch, what spice was present earlier has almost completely dissipated; it begins to transition into a hardwood forest-floor earthiness. It reminds me of the aroma from a forest after a steady rain. The burn has been quite well behaved, providing a mottled gray and white ash with a flaky appearance but solid in character. It is releasing voluminous amounts of mouth-coating smoke. This smoke really sticks to the palate, providing a nice, long-lasting oaken finish. Going into the middle portion of the cigar, the Rapture Maduro is fairly uneventful as far as flavor changes are concerned. It remains predominantly framed by the pleasant earthiness mentioned in the first segment of smoking. But, in all honesty, if it’s already a pleasant experience, why would you want to go changing? Nearing the final third, I do find it becoming more woodsy and less “forest-floor” in character. This lighter, more woodsy earthiness becomes the predominant flavor family during the final third. The strength also picks up a notch. In fact, a couple of notches. It never becomes overpowering, but the potency will become noticeably stronger during the final stretch. Nice review, Kip. I’ll be keeping my eyes out for this bad boy. Even though this was their second trade show, I feel that in the recent months they have made a lot more noise on the web and social media sites compared to last year. Glad to see a small company creating exceptional sticks.